Overheating can be a serious problem for horses. While most common in the summertime, horses are susceptible to overheating all year long. Horses that are overweight or out of condition are most prone to overheating. Weather conditions may also contribute to this problem, as hot, humid weather is tougher on horses than cool or cold weather with crisp air. A breeze, either natural or artificially supplied by a fan, can help keep a horse cool. How can you tell if your horse is overheated? First, look at his breathing. A horse should breathe more rapidly right after exercise, but if the rapid breathing continues after a few minutes without any sign of slowing down, there could be a problem. Checking his temperature is another good idea. Any horse with a temperature over 102°F after a cool-down walk from working warrants a call to your veterinarian. Checking the capillary refill in your horse’s gums is another good quick check, too. A normal horse’s gums should be a healthy pink color. The color fades when you push on his gums, but it should return in under 3 seconds. Check for signs of dehydration with a skin-pinch test. Gently pinch up some skin along your horse’s neck between your fingers. This will form a small “tent,” and the tented area should snap back down quickly. If it is slow to return to normal, your horse is dehydrated. You may also notice an overheated horse just standing, not interested in his surroundings. He may not even be trying to sneak some grass. Weakness in his gait is another telltale sign. One of the immediate things you can do is to hose your horse down with cool – not ice cold – water. Don’t leave the water standing on his coat; scrape it off. That removes the warmed-up water and helps with cooling. If you can, get him into a breezy area or turn a fan on him. Horses cool down by sweating, and the air action will help whisk away any sweat. Offer water to encourage drinking. Most horses prefer water about 68°F – so again, not ice cold. Start with plain water, but you may want to also offer electrolyte water (see below). Since sweating is the normal cooling mechanism for a horse, it is important to support that bodily function. Hydration is most important. Your horse should always have free access to cool, fresh water. The one exception is right after vigorous exercise. At those times, your horse should be allowed small drinks as he does his cool-down walk. Along with water, sweat contains electrolytes (minerals that are important for bodily functions). In fact, the minerals classified as electrolytes such as sodium, chloride and potassium, along with smaller amounts of magnesium and calcium, are actually excreted in higher amounts in your horse’s sweat than they exist in his blood. A horse that is working hard, and consequently sweating hard, will benefit from some electrolyte supplementation. This is true even if the horse has a mineral salt block available at all times. Electrolyte supplementation can be done in a couple of ways. A horse who is lightly worked may do fine with some sodium chloride (regular salt) and some potassium chloride (light salt) added to his grain. Check with your veterinarian on how much to add based on your horse’s normal diet and his workout schedule. Horses that are working hard, training or competing in hot, humid conditions, or competing in very tough sports such as three-day eventing or competitive trail riding, will benefit from complete electrolyte mixes. These may come as a powder to add to your horse’s water, a powder or paste to add to his grain, or a paste to deliver directly to him. Horse Health™ Electro Dex® and Apple-Dex™ electrolytes help replace fluid and minerals lost through sweat from summer heat, training and performance. Both products are powders that can be top-dressed on grain or mixed with water. 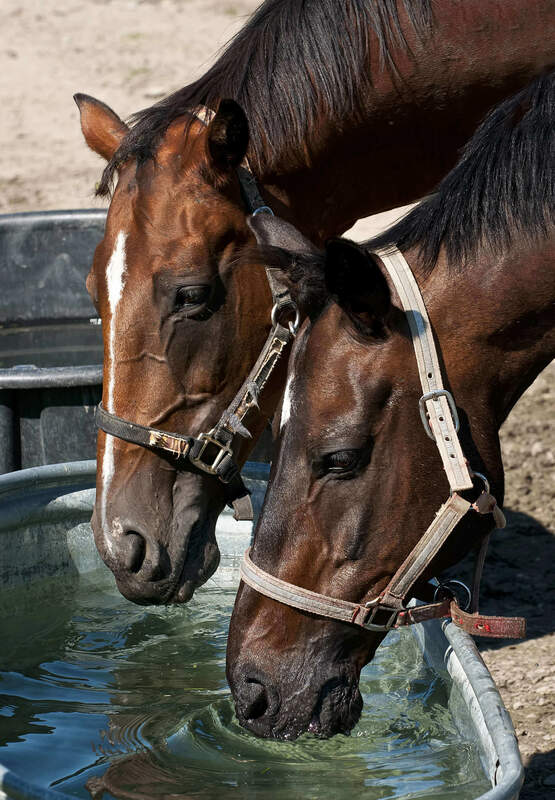 Research has shown that horses will actually drink more while working if offered electrolyte-laced water; however, it is important to also offer fresh (plain) water side-by-side with electrolyte-laced water because you don’t want your horse to overdo his electrolyte restoration. If your horse turns his nose up at the electrolyte water, you may need to add a bit of flavoring to entice him. A mildly overheated horse generally responds rapidly and fully to at-home TLC. If your horse is not responding, don’t hesitate to call your veterinarian. With care, conditioning, attention to hydration, and electrolytes, your horse should never suffer from overheating. Horse Health, Electro Dex and Apple Dex are trademarks of Farnam Companies, Inc.
Related articles you might like..
Sign up for our newsletter to get helpful horse care tips, product updates, special offers and more. ©2017 Farnam Companies, Inc. All trademarks are the property of their respective owners.